Looking for some fun activity (that’ll get those muscles into gear) on the beach? 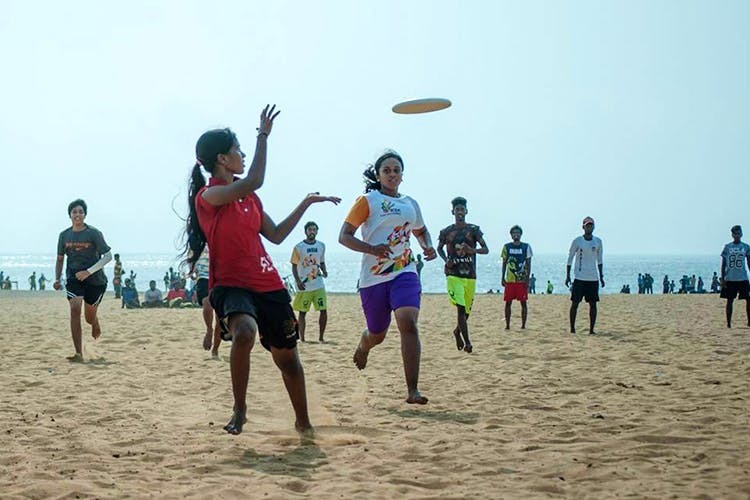 Check out this frisbee club – Chennai Ultimate Frisbee – that’s going to give you one heck of a workout. Although Ultimate is a relatively new sport in the country, it’s been India’s fastest growing team sport with over 300 players in the city. You can be a part of the team and play tournaments or just play for recreation by joining a practice session, the choice is yours. But all you sports buffs out there, don’t miss out on this fun beach sport and be part of a community that considers the beach a second home rather than just a play ground. Ultimate is not just a sport but can also be an insane workout. So why hit the gym when you can stay fit while playing a sport on the beach? Ultimate includes extensive high-intensity running, lightning fast reflexes, and jumping due to the aerial flight of the disc. This will surely cover cardio, leg day and arm day in a single session; so much more fun than going to a gym, we think. The sport also teaches you so much about team spirit and it’s one of the few co-ed sports where both genders can assume either cutting or handling positions. Double yay!